652 Your Destruction, Embrace it. Jess’s battle cry comes from when I used to play Phantasy Star Online. You could set buttons to have useful phrases display since there was no voice chat. I used mine for greetings and battle cries. PSO is also where I first started using Crave The Bullet as a net handle, in case you ever wondered why my login isn’t just my name. My old save data for those original PSO characters just happen to be within arm’s reach. I always thought the Dreamcast VMU was cool. The battery issue was terrible, but they are just neat. In many ways the Gamecube version was superior, but the tiny memory card lacked that sense of pagentry you get from locking your VMU into your controller. Hmm… that last panel is conveniently wallpaper-sized. I’m predicting destruction of the Nintendo variety. I hope were getting trolled right. Sir that refernece is for win! XD I can see as how you might get that. O_O I embrace it, I embrace it! 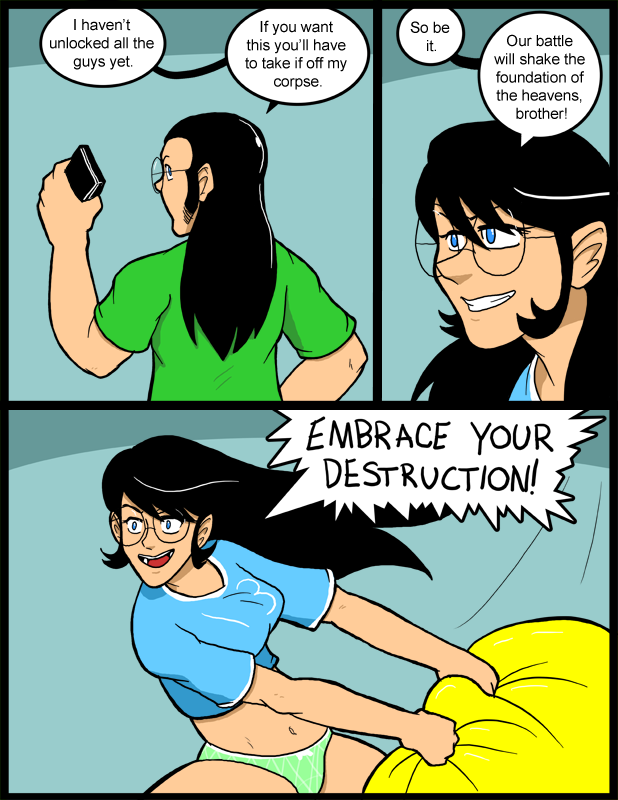 So if she’s destruction incarnate, can I embrace destruction all night long? Oooooooooh man! If either of them goes super saiyan, I’m going to explode because of the pure awesomeness! Hmmmm, is that a Paper Mario 2 Reference? Seems familiar. The Dragon in Paper Mario 2 was always talking with LeTtErS LiKe ThIs! sO ThAt MiGhT Be iT! I wanna say Mega Tokyo… but I’m afraid I’ll be shot. I don’t think you’ll be shot, Mega Tokyo is exactly the kind of thing that would probably have a reference to whatever Pathogen is referencing too. Eeep! Girl with crazy eye! RETREATRETREATRETREAT! AUGH!!! No DS Lite armor!!! OCD protectiveness of fragile material possessions is taking control!! Hmmm… to discuss the comic (<3 Jess more the more violent she gets) or PSO (I was so boss at that)…..